New show quality polished chrome center caps set featuring the raised "SS" logo on black background for your Chevelle or Nova. Exact in detail to Chevelle and Nova originals. This kit includes all 4 caps, backing retainers, and mounting hardware. Deep dish means where the SS insert is, its about a 1/4 inch deep. If you want the real factory correct Super Sport caps, here they are. Magnificent set of center caps! New SS wheel center cap retainer mounting bolts for your GM classic. These are the cap mounting backing retainer bolts. Designed to work with the five spoke SS wheel rims. Correct shape, size, and details. Sold as an 8 piece kit, does all four caps. New SS wheel center cap retainer for your GM classic. This is the cap mounting backing, retainer. Designed to work with the five spoke SS wheel rims. Correct shape, size, and details. Replaces original GM part number 393799 perfectly. 14X7 Stock Steelie COPO style dog dish wheel is now available. This steel wheel is 14 X 7 and sold individually. This O.E. Style Chevy wheel in primer is a versatile wheel that fits 10 1/8" outside knob caps. Perfect wheel for the COPO or SLEEPER look. This will was found on the COPO Super Cars with the GM factory dog dish hub caps. These steel wheels are an easy way to upgrade the look of your car or truck. Paint them the exact color you want, and with so many different caps to choose from, you can easily customize these wheels to your own unique style. Proudly Made in the USA! Pictured painted with the Dog Dish Poverty Hub Cap for reference only. Cap, Paint, and Tire are sold separately. New OE style Super Sport five spoke wheel for your Chevelle or Nova. Exact factory shape, size, and design. Factory original size of 14 inches in diamter and 7 inches wide. Comes pre-coated and ready to go. Add this optional SS wheel to your classic today! New 14 x 7 Rally wheel trim ring for your classic. Replaces GM part number 475020. Picture of the correct wheel these fit is for reference only. Set of four 14 x 7 Rally wheel trim rings. Replaces GM part number 475020. Picture of the correct wheel these fit is for reference only. New correct size trim ring for your Super Sport SS style wheel. Exact stainless steel design. 14" x 7" deep trim ring. Exact for 69 five spoke style wheels. Replaces GM part number 9796919. Picture of the correct wheel these fit is for reference only. New correct size trim rings for your Super Sport SS style wheels. Exact stainless steel design. 14" x 7" deep trim rings in a set of 4. Exact for 69 five spoke style wheels. Replaces GM part number 9796919. Picture of the correct wheel these fit is for reference only. New 15 x 6 Rally wheel trim ring. Inner clips go all the way around the ring. Outer lip is rounded and valve stem opening is "U" shaped. Correct rally wheel picture shown is for reference only. Sold as each. New set of four 15 x 6 Rally wheel trim rings. Inner clips go all the way around the ring. Outer lip is rounded and valve stem opening is "U" shaped. Correct rally wheel picture shown is for reference only. Sold as a set of 4. New 15 x 7 Rally wheel trim ring for your Chevelle or Nova. Features the correct stepped edge design, very very close to what was installed on your 15 x 7 inch rally wheels from the factory. Made from premium quality stainless steel. Replaces original GM part number 9796696. Correct wheel application shown is for reference only. Please look at the pictures shown and make sure this is the version you need. New set of original style trim rings for your Chevelle or Nova. This version fits all 15 X 7 inch rally wheels. Features the correct stepped edge and four inner riveted mounting clips. The clips don't wrap around the outer lip of the rim like some older versions. These are the most correct trim ring available today. Beautiful stainless steel, the real deal. Replaces original GM part number 9796696 perfeclty. Made in the USA! Very limited quantity, when they are gone, that's it! 15X7 Stock Steelie COPO style dog dish wheel is now available. This steel wheel is 15 X 7 and sold individually. This O.E. Style Chevy wheel in primer is a versatile wheel that fits 10 1/8" outside knob caps. Perfect wheel for the COPO or SLEEPER look. This will was found on the COPO Super Cars with the GM factory dog dish hub caps. These steel wheels are an easy way to upgrade the look of your car or truck. Paint them the exact color you want, and with so many different caps to choose from, you can easily customize these wheels to your own unique style. Proudly Made in the USA! New OE style Super Sport five spoke wheel for your Chevelle or Nova. Exact factory look and design. Custom size of 15 inches in diameter and 7 inches wide. Comes pre-coated and ready to go. Add this super cool SS wheel to your classic today! 15" Deep Dish Triple Chrome Plated Stainless Steel Trim Ring. Fits 7" wide Factory or Aftermarket Rally Wheel Style wheels. 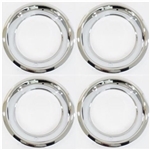 New 15 x 7 round smooth edge Trim Ring in Chrome Plates Stainless Steel. 15X7 Trim Ring sold each. Stainless Steel Trim Ring with Chrome Plating. Benefits of Stainless by not rusting yet the awesome look of chrome. We also have Matching 15x8 Smooth Edge Trim Rings PART# WHE-102, if you need. New original style trim ring for your classic. This version fits all 15 X 7 inch rally wheels. Features the correct stepped edge and four inner riveted mounting clips. The clips don't wrap around the outer lip of the rim like some older versions. This is the most correct trim ring available today. Beautiful stainless steel, the real deal. Made in the USA! Very limited quantity, when they are gone, thats it! 15X8 Stock Steelie COPO style dog dish wheel is now available. This steel wheel is 15 X 8 and sold individually. This O.E. Style Chevy wheel in primer is a versatile wheel that fits 10 1/8" outside knob caps. Perfect wheel for the COPO or SLEEPER look. This will was found on the COPO Super Cars with the GM factory dog dish hub caps. These steel wheels are an easy way to upgrade the look of your car or truck. Paint them the exact color you want, and with so many different caps to choose from, you can easily customize these wheels to your own unique style. Proudly Made in the USA! New oe style super sport five spoke style rally wheels for your Chevelle or Nova. Exact factory shape, size, and design. Original 15 X 8 size. Features a 4 and 1/2 inch backspacing. Comes powder coated and ready to go. Add this optional super sport wheel to your classic today! Get a great look at a great price with this NEW SBC BLACK Valve Cover, Timing Chain Cover, Breather, and Dipstick Engine Dress Up Set. Perfect fit and killer look for your Small Block Chevy Engine in a Chevelle or Nova. Manufactured from premium quality steel coated BLACK for a great look. Exact fit for all SB Chevy engines including 302, 307, 327, 350..ect. Sold as a set only. Order your new set today and SAVE! 1) 1 pair of smooth baffled short OEM style BLACK steel valve covers, 2 5/8" tall. 2) 1 BLACK engine dipstick & steel tube. 3) 1 smooth BLACK steel push-in style breather cap. 4) 2 rubber PCV grommets. 5) 1 BLACK steel timing chain cover. 6) 1 BLACK steel timing tab. Get a great look at a great price with this NEW SBC BLACK Tall Valve Cover, Timing Chain Cover, Breather, and Dipstick Engine Dress Up Set. Perfect fit and killer look for your Small Block Chevy Engine in a Chevelle or Nova. Manufactured from premium quality steel coated BLACK for a great look. Exact fit for all SB Chevy engines including 302, 307, 327, 350..ect. Sold as a set only. Order your new set today and SAVE! 1) 1 pair of smooth baffled tall style BLACK steel valve covers, 3 5/8" tall. Door latch mechanism mounting screws set of 3. Excellent quality. Works great for all OE style points type distributors. Fits all V8 engines, small block or big block. New premium quality headliner installation tool for your Chevelle or Nova. This handy tool is a must have when installing any bow style headliner. Do it right! Fits: 62, 63, 64, 65, 66, 67, 68, 69, 70, 71 & 72 Nova and Chevelle. New two bar window crank knob in chrome for your 63 and 64 Nova / Chevy II. Looks great! Works with all Chevelle & Nova models, but was only factory installed on 63 and 64 Novas. Sold each. New premium quality 1964, 1965, 1966 and 1967 shift cable for your Chevelle. Exact fit for all TH350 or TH400 automatic models with a floor shifter. Works great for all turbo 350, turbo 400, and even newer TH700-R4 , TH200-4R or 4L60 overdrive transmissions. New exact fit sound barrier insulation for the doors and inner quarters of your 64 - 67 Chevelle. These door insulation kits provide the sound solution you have been looking for. Your Chevelle will remain cooler as these pads help prevent the transfer of heat to the interior of the vehicle. Backed with adhesive for easy installation. Whether you want to kill the unwanted noise coming from your doors or enhance the sound effects of your new sound system, this kit gets the job done. **Note: Please review Technical tab for installation instructions. OEM rubber control arm bushings allow too much deflection on the control arms. Polyurethane bushings resist smooth rotation and impose stiction. Delrin bushings eliminate the deflection AND the stiction, leading to a huge improvement in both ride quality and handling. 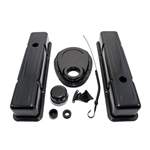 Fits 64 - 67 Chevelles. New reinforcement plate for your Chevelle. Works great for all short water pumps. Zinc plated, just like factory units. A must for correct pulley alignment. Fits all; 68 Camaro, 64-68 Chevelle, 66-68 Chevy II, 58-61 & 67-68 Corvette, 55-68 Truck, 55-68 Full Size Chevy. Replaces original GM part number 3720616 perfectly. New correct design cigarette lighter receptacle housing dash retainer. Works great for most all 1964 - 1970 models. This receptacle housing case secures your female recepticle to the dash. Simply screw into place. For use with rochester type lighters only. 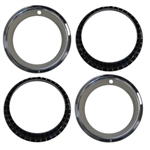 These headlight rings are hand crafted to the exact dimensions of the original equipment GM headlight retainer ring and are designed to fit any GM car that features a 5 3/4″ headlight. Each ring is machined from solid 6061-T6 aluminum, then polished to a perfect mirror finish. Rings are sold as a set of 4! This set has a black finish. Headlight Bulbs are NOT included with the purchase! Designed to work specifically with the Delta H4 headlight. These billet aluminum headlight rings add a unique look to any car by day and especially by night. This set has a polished finish. New correct design cigarette lighter female receptacle housing. Works great for most all 1964 - 1970 models. This receptacle has the round pin style design wiring terminal connector on the back side. Your lighter slides into this unit. For use with rochester type lighters only. Check your wiring harness to see if you need the pin type or the blade type housing. NEW, 1964 - 1970 VENTED Gas Cap for your Chevelle. Fits all models Except El Camino and Wagon, Vented. 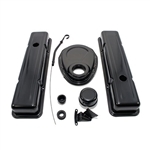 New set of Headlamp Buckets and Retaining Rings for your 1964 - 1970 Chevelle. Sold in a complete 8 piece kit to get the job done right! Does both left and right hand and includes headlight ring retainer screws. New headlight retainer ring (Single) for your 1964 - 1970 Chevelle. This is what retains the headlight into the bowl, without it your headlamp would fall out. Its always a good idea to make sure these are secure and in working condition after replacing your bulbs. Copyright © Muscle Car Central. All Rights Reserved.